We offer the largest selection of fine art paintings by respected Chinese artist Lin-Hua Wu. Each original watercolor is hand painted in the Lingnan School of Painting style onto traditional silk, rice paper or contemporary Shikishi artboard material. 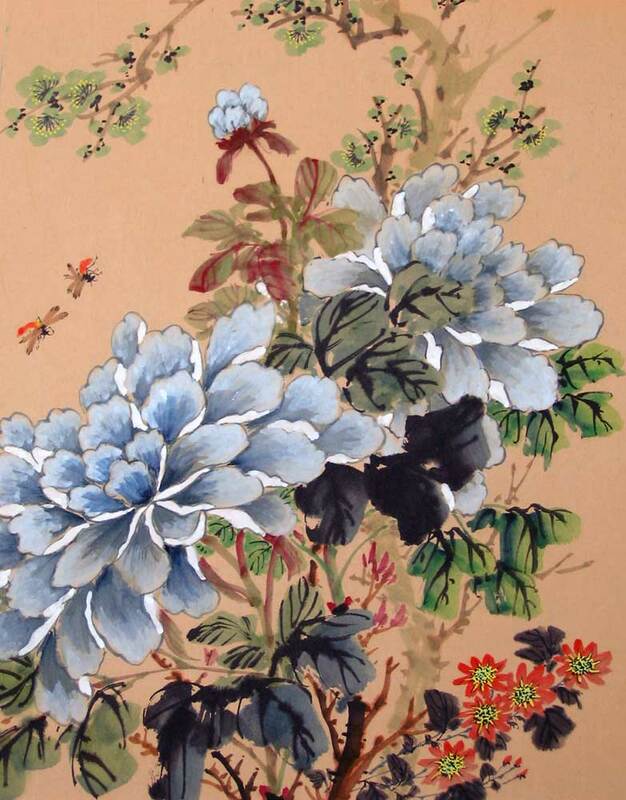 These one of a kind Chinese paintings will add a classic feel to any room of a house or office. Custom Chinese paintings are also available. Prices begin at $45. Free shipping in the USA with a money-back guarantee. 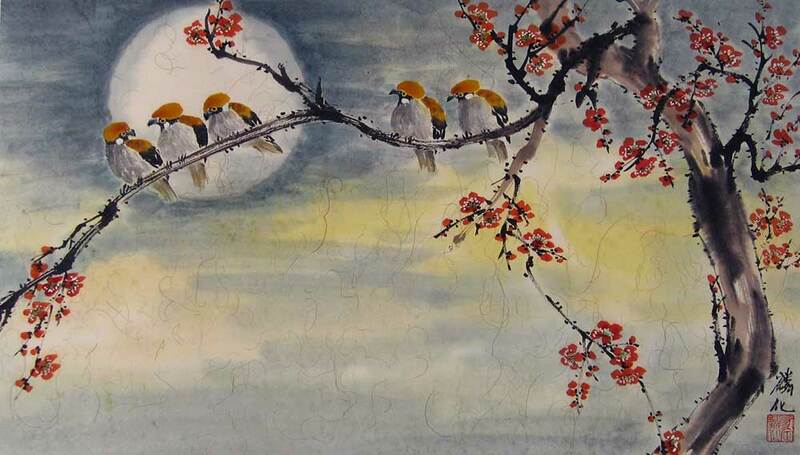 For ideas on how to request a custom Chinese painting on silk, rice paper, shikish, or special materials such as cloth or a vase that meets your exact desire Custom Arts. Sign up for special offers, new products, and more. Join our Email Club. Chinese painting has become very popular in the Western world, particularly the United States. Chinese paintings are known for their beautiful landscapes and paintings of mammals, birds, and fish. In Chinese painting there are two basic techniques, “meticulous” or Gong-bi and “freehand” or Shui-mo. Meticulous is very detailed while freehand is more impressionistic. Most Chinese consider landscape paintings as the top example of Chinese art, and many Westerners agree. 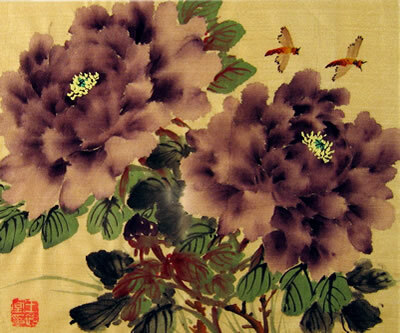 Traditional Chinese silk painting involves nearly the same technique as calligraphy, for which the Chinese are also famous. It is produced with a brush dipped in black or colored ink and applied primarily to rice paper or silk. Early Chinese silk paintings dating back to 400 B.C primarily depicted the human figure. Over time landscapes and animals became more popular, but the human figure still plays an important role. During the Tang Dynasty (618 – 907 A.D.) mountain paintings with waterfalls (shanshui) became very popular, as they are to this day. The Chinese silk paintings were not attempts to perfectly depict the true appearance of nature, but to capture the emotion of nature. From the 1600s to the early 1900s many artists began to rebel against the more traditional rules of Chinese painting and started using a more free type of brushstroke. Among those who rebelled in the early 1900s included two brothers Gao Jianful and Gao Qifeng who developed the Lingnan style of Chinese silk painting. These two greatly influenced Lin-Hua Wu’s paintings and he ultimately was trained by some of the early Lingnan masters. 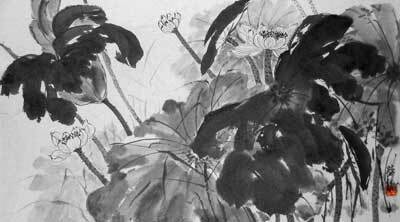 In Chinese painting plants represent many different things. The lily represents forgetting one’s troubles. The lotus is held in high esteem in Chinese symbolism and represents purity, modesty, and love. The peach and pear symbolize longevity; the plum, good luck; the rose, youth and the four seasons; the willow is the symbol of spring. Many types of fruit are featured in Chinese painting, including berries and peaches. 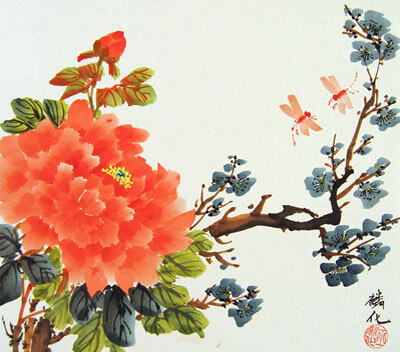 Peach blossoms are associated with good luck, while the peach fruit is associated with long life. 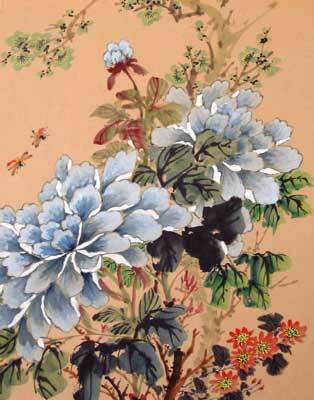 Chinese painting is famous for its focus on flowers. 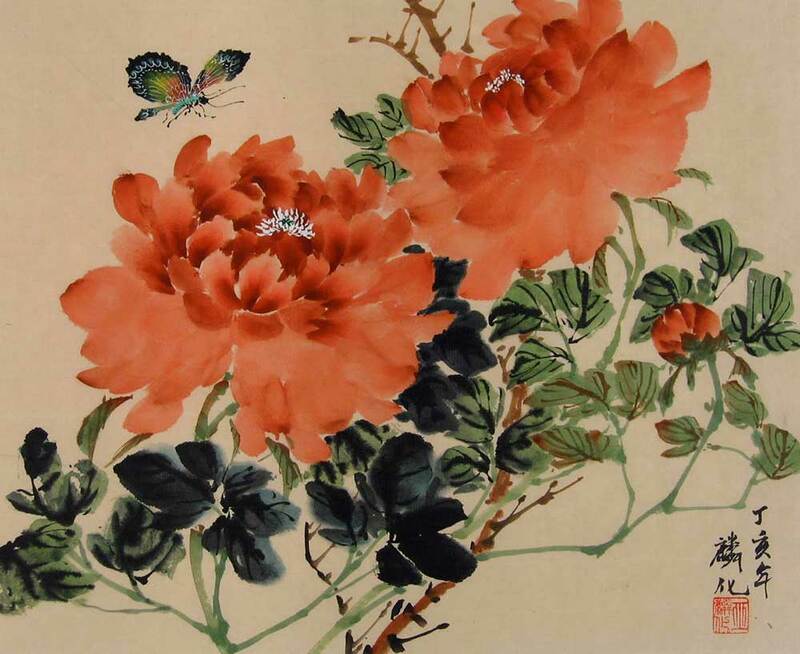 The orchid, lotus, and peony are three of the most popular subjects of Chinese art. The peony is associated with social status, and luxury. Of course, often it simply represents its natural beauty. The lotus typically represents purity. The orchid represents elegance. In Chinese painting bamboo, an evergreen, can represent youth, longevity, suppleness, strength, endurance, modesty, summer, and luck. Many Chinese paintings consist exclusively of bamboo because of its importance in China. Even when bamboo is the focus of the painting, small birds may be seen sitting in the bamboo or flitting about the bamboo. In other Chinese paintings, bamboo is simply used as part of the background. Landscape paintings are perhaps the most popular form of Chinese art, both in China and the U.S. Scenes often include high, steep mountains, frequently including waterfalls or rivers. 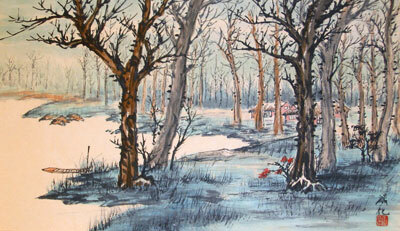 The impressionism of the Lingnan style of Chinese painting is particularly effective in landscapes. Chinese landscapes sometimes include buildings, wooden bridges, and people in the background. Trees populate nearly all Chinese landscapes and may be in the foreground or background. Some paintings are set by the ocean and almost always include rock cliffs or small but steep mountains rising out of the water. Lake scenes will sometimes include a small boat or a person fishing from the bank. Occasionally the Great Wall of China is seen in the background. Animals play a major role in Chinese painting. The mammals most seen in Chinese art include tigers, dogs, cats, water buffalo, wolves, squirrels, lambs, deer, horses, bears, rabbits, and even pigs, bats, and mice. 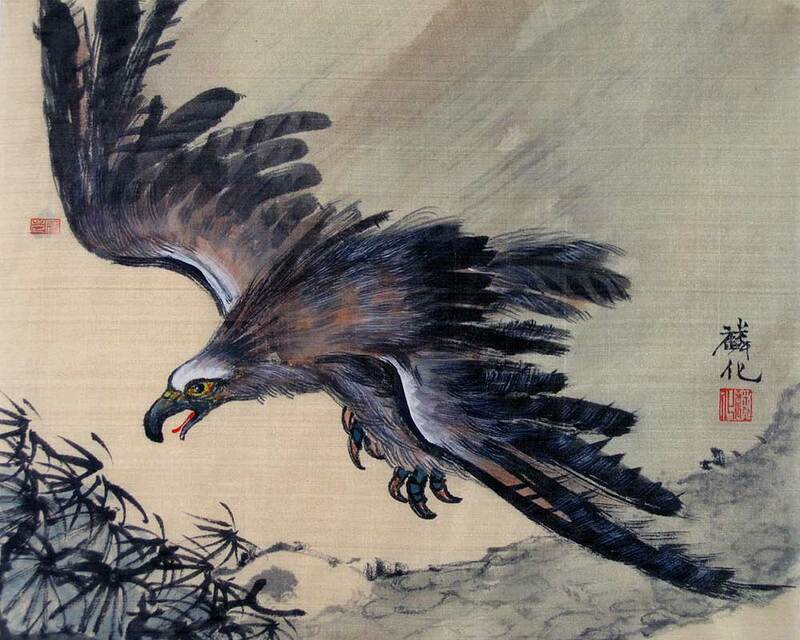 Birds are heavily portrayed in Chinese painting, particularly roosters, eagles, crows, egrets, ducks, herons, parrots, and owls. While many types of fish are seen in Chinese art, goldfish and carp are most common. In Chinese painting, birds are a major focus. Whether in the foreground or background they add color and beauty to a painting. In Chinese painting fish most typically symbolize wealth. The Chinese word for goldfish is made up of two words meaning gold and abundance, explaining why many Chinese keep goldfish in their homes or in ponds. Unlike in the U.S, the carp is revered in China and represents success in business. Fish are usually shown in pairs. As with other cultures, the eagle is viewed in China as a symbol of strength and can represent a hero who fights alone. The eagle is very popular in Chinese painting. The duck often represents wedded bliss in Chines painting, at other times it simply provides an opportunity to highlight a colorful, beautiful, much appreciated bird. Roosters often appear in Chinese paintings. The rooster is believed to ward off evil and can mean flamboyant. The mouse plays a large role in Chinese culture. The mouse is most recognized for its fertility and rapid reproduction. Among some ethnic Chinese groups the mouse is revered as a hero, while others associate the mouse with plagues. The mouse is also associated with prosperity. In other circumstances the mouse is disliked because it steals food from humans. The domesticated cat is prized in Chinese and Western culture. It is valued both as a companion as well as its skill in catching mice. In Chinese painting the cat is often shown playing with other cats. It is also shown playing with an insect or hunting a mouse. People around the world love watching frogs in the wild as they swim and jump about. They also enjoy keeping them in their homes in terrariums. Rabbits represent calmness and tranquility and are used in Chinese paintings, because as in the U.S, everyone likes rabbits. In most cultures, the lamb represents gentleness and something requiring protection. In Chinese painting, the artist typically captures these qualities. The dog is one of the animals found in the Chinese zodiac. 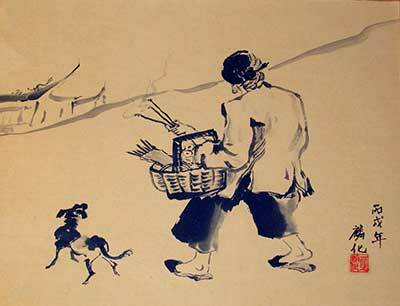 In Chinese symbolism and Chinese painting, the dog is known for its ability to understand humans and the human soul. The egret is a beautiful and graceful bird that is admired in nearly all cultures. The egret and heron are the subjects of many Chinese paintings. In nearly all cultures the deer is recognized for its beauty. It seems everyone loves deer because of their grace and gentleness. 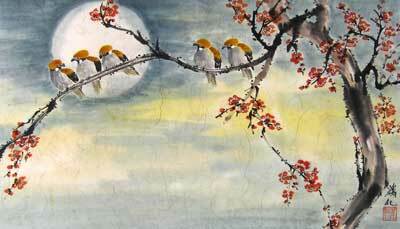 That grace and gentleness is well captured in Chinese painting. As in many cultures, the crow can be both admired and disliked. In nearly all cultures, including Chinese, the crow is respected because of its intelligence. It can also be disliked for its loud cawing, which often wakes people up in the morning. In Chinese symbolism and paintings, the crow may represent the sun. The parrot, perhaps because of its long life, sometimes represents in Chinese painting, a warning to remain faithful in a relationship. In paintings the parrot also provides bright colors and is popular because of its ability to mimic human words. In Chinese culture, buffalo means water buffalo, not the American bison. The water buffalo is highly relied on in China for many forms of agriculture, including rice production. In Chinese painting the buffalo represents power and strength. In Chinese painting the bear symbolizes strength and courage. People are featured in many Chinese paintings, often with animals, since animals have been so important in traditional Chinese agrarian society. People are often the focus of the painting, while at other times a secondary, but important part of the painting. Bats are highly valuable creatures because they consume huge amounts of insects. In China the bat is highly appreciated and is found as a subject in Chinese painting. In China the bat is related to longevity, happiness, and good luck. While not a primary animal found in Chinese painting, the pig is used in part because it is viewed as reliable and honest. The donkey is known both for its stubbornness and its ability to carry heavy loads to market. In the West, the owl is viewed as wise, but in Chinese tradition it can be associated with death. In Chinese painting, the owl often seems to be used simply because humans find them so interesting to watch. Perhaps some of the appeal is that since owls are nocturnal, it is hard to observe them. People around the world love to watch squirrels scurrying around gathering food and playing with each other. In Chinese painting they are usually represented in pairs. The art of painting on silk goes back for centuries. Silk has a strength, durability, and texture that makes it an excellent choice for watercolor painting. Paintings are created on Washi paper that has been mounted onto gold trim art board. This process produces paintings that do not need framing and come ready to be displayed in your home. Rice paper was developed centuries ago in China and Japan for the purpose of calligraphy and brush painting. It is particularly durable, with a distinctive texture and a slight translucency, that is perfect for displaying dynamic strokes.